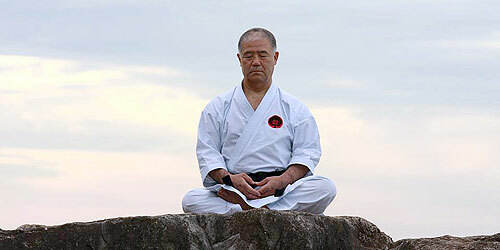 Higaonna Sensei born in Okinawa on Christmas day in 1938. As a young boy he trained with his father in another style of Karate and was immediately taken in by what he saw and learnt. 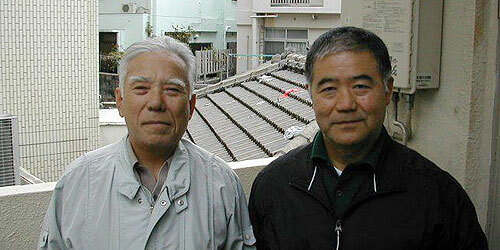 Soon after he began training with a school friend, Tsunetaka Shimabukuro Sensei, in his front garden. Shimabukuro told Higaonna Sensei of the immense power of Goju-ryu and that he should join the garden dojo of Miyagi Chojun Bushi. 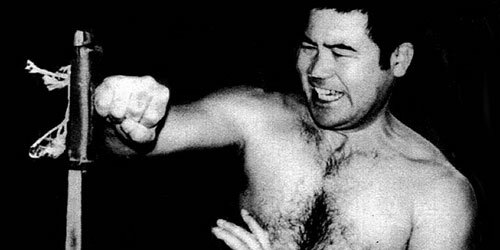 So at the age of 16, and with the appropriate introductions arranged, the young Higaonna presented himself at the garden dojo of Miyagi Bushi to train. Miyagi Bushi had since passed away but one of the seniors told Higaonna Sensei that An'ichi Miyagi is the most knowledgeable, go and learn from him. 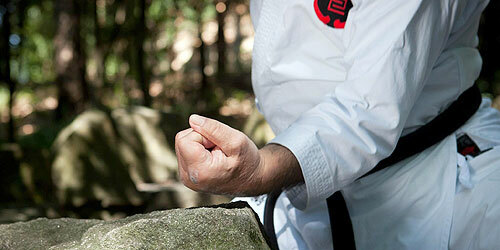 This began a life long relationship between Higaonna Sensei and his teacher, Master An’ichi Miyagi. An’ichi Sensei is a direct disciple of Miyagi Bushi and spent extensive time training with the latter in private at his home in the legendary “garden dojo” of Chojun Miyagi Sensei. When his mentor, An’ichi Senseis, work took him over seas, Higaonna Sensei decided too, to see more of the world. He attended Tokyos Takushoku University and opened the legendary “Yoyogi dojo” in Tokyo. Yoyogi would become one of the most famous and most attended dojo's by foreigners in the world during the 1970's and early 1980's. 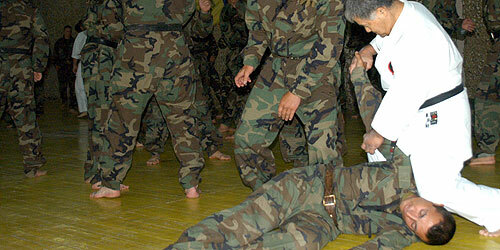 Higaonna Sensei began extremely well known and earned the description as the most dangerous man in Japan in a real fight. 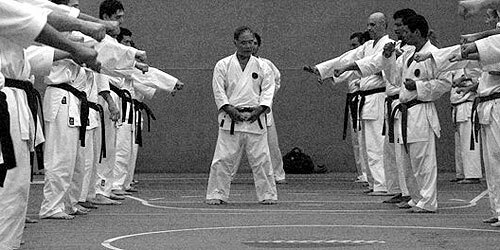 In July, 1979 in Poole, England, Higaonna Sensei founded, with the permission of many of Chojun Sensei's senior students, the International Okinawan Goju-ryu Karate-do Federation (IOGKF) a federation dedicated to spreading the true Karate, philosophy, and teachings of Miyagi Chojun Sensei throughout the world. Today the IOGKF has over 50,000 members in over 50 different countries. Higaonna Sensei now lives back in Okinawa where he has since established the famous Higaonna Dojo and has credit for turning out such fine instructors such as Sensei's Bakkies Laubscher, Kazuo Terauchi, George Andrews, Ernie Molyneux, Nakamura Tetsuji, just to name a few. He travels internationally regularly to conduct seminars around the world and with the aid of some of his most senior and dedicated students. 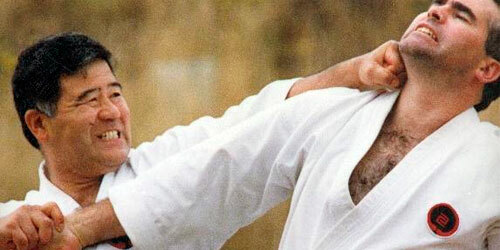 His is as humble as any human could be and is a true Master of the Martial Arts. 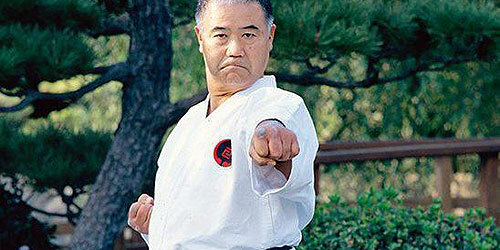 He was graded to 10th Dan in September 2007 by his Masters, Master An’ichi Miyagi and Master Shuichi Aragaki - both direct decendents of Miyagi Chojun Sensei, the founder of Goju-ryu Karate. 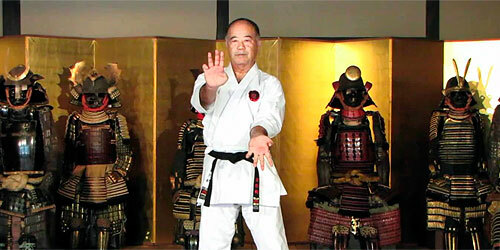 Higaonna Sensei hosts a World martial arts festival (World Budosai) every four years in Okinawa. These are some of the World's largest Gasshuku's with over 1000 participants attending in recent years. On May 8th, 2013, the Okinawan Government presented Higaonna Sensei with an award recognising him as a Intangible Cultural Treasure for the island for his many years of dedication and preservation to Goju-ryu Karate as an important part of Okinawan culture. This is an honour very rarely bestowed.